A lovely lady over on the Education Forum liked my post about how Wallace Milam found Jean Hill's dog. This was at, I think it was an A.S.K. conference in Dallas, and the way Wallace talked about it in his opening remarks, it was kind of a laugh. I, and I'm sure many others thought,'There's no way you found a little white dog, there's no way," and like many things in this case as in life you find great things when you were really looking for something else. I think he was looking for something to challenge Posner or Lattimer, and he indeed found Jean Hill's little white dog. It was a stuffed animal or puppet given to Jackie as she shook hands with people, working the fence at Love Field. Wallace thinks it's of Lambchop, a popular white sock puppet that had it's own TV show once, Sheri and Lambchop. I met Jean Hill in 1991 at the first A.S.K. conference. I got her autograph on the program, and took a picture of her. I told her I thought she was the bravest woman I've ever heard of. It's hard to imagine the fear she, and other witnesses must have felt over the years. So, while I try to figure out what kind of equipment I have to buy to upload stuff from VHS tapes, here's some images Berncie let me borrow. 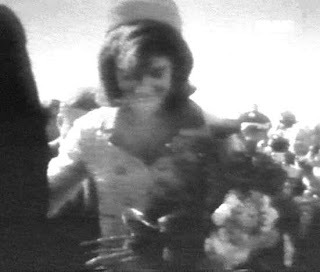 I wish I had a clear photo to show you the person giving Jackie the puppet. I don't think one really exists. Wallace's source was a Black and White film. 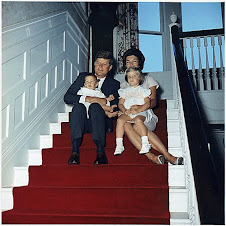 But, this is a nice one showing Jackie getting into the presidential limousine. 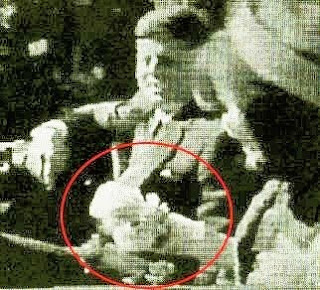 Here's a kind of blow-up of the photo centering on the puppet, Lambchop, if it's Lambchop, it's certainly Lamchop-like. I think you can make out the head of the puppet, large white floppy ear, a face or snout with eyes, nose and mouth. The eyes look closed here like the puppet is sleeping. This is from a film, and it's usually edited out. 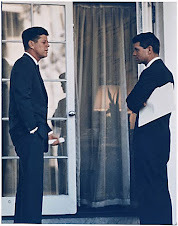 Once Jackie and President Kennedy are seated, Jackie quickly shows it to JFK. Okay, in this picture it's still the same puppet, but the face doesn't look like Lampchop to me. Here the puppet seems to have an almost Warner Bros, Looney Tunes kind of face. The eyes are open and look close together. The eyebrows have a kind of V shape, coming together just above the nose giving the puppet a kind of comical angry look. The cheeks look big and round, larger than the area of the eyes and forehead. Maybe there were two puppets given to Jackie, or maybe I'm wrong about the way the face looks here. 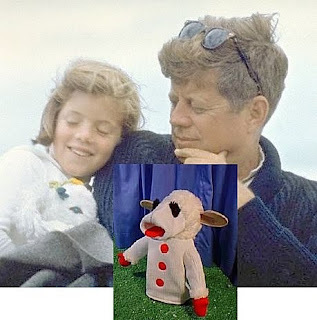 But the icing on the cake is this photo showing JFK with Caroline, and Caroline is playing with Lambchop, or a Lambchop-like puppet. So, if the public knew Caroline liked Lambchop then someone was really nice at the fence at the Love Field airport. And, of course, Jean Hill was right all along. 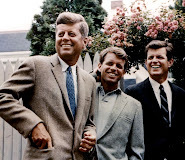 In the split seconds when the shooting started and before the headshot at Z313 when people knew something odd was going on, but not quite getting it, and if you're looking at JFK and Jackie, he's hit, with his arms up and bent with his hands going to his throat or face, and bent slightly forward and towards her, and Jackie is leaning into him, wondering what's going on. They are leaning a little towards each other, it could look like they're looking at the space between them on the backseat. I'm sure it was a moment when you're wondering what are they doing? 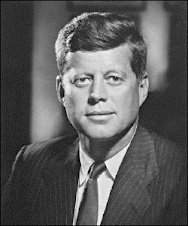 Then JFK's head explodes.